Three years ago my novice interest in birds was over indulged. My Christmas gifts included bird books, feeders, nesting materials, and a beautiful bird bath. I am still a novice, but I can identify all the birds in my yard by sight and most of them by sound. Iâve collected a treasure of special bird stories to share with anyone that even hints at an interest in birds. In a nutshell, Iâve gone to the birds. One of the aspects of birding that Iâm well aware of now is the fact that if you pay attention, they pronounce the seasons as clearly as the weather. So as we march into wintertime, I can confirm the season as I watch and listen to the birds. Fall is heralded by the Golden Crown Sparrow. Their song is a child hood memory for meâ¦â?Oh Dear Meâ? – they stay until springtime. The Golden Crown and the White Crowns are a winter staple in the backyard. They join the year round residents: Hummingbirds, American Goldfinch, Towhees, House Finch, Pygmy Nuthatch, Bushtit, Chickadee, Common Sparrow, Mourning Dove, Black Phoebe, Robin, the occasional Stellar Jay, and, my least favorites, the Brewerâs Blackbird and the English Starlings. 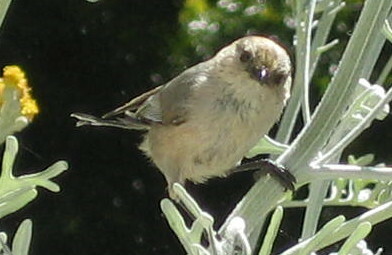 The Bushtit is Cherie’s longtime companion, Peter Logan’s favorite fuzzy bird in the garden. The Fox Sparrows are a current favorite of mine that also hang out during the winter. There are only a few of them in the yard. They are distinct against the dozens of other types that visit our feeders with their speckled breast and bold behavior (Sparrows like to feed off the ground under the feeders â they donât actually get onto the feeders often). One of our current residents is a Townsend Warbler. He is a colorful contribution to the duller colors the birds sport in the winter. Heâs not a seed eater, so heâs especially welcome to eat the insects that collect around the yard. There is one aspect of attracting the songbirds to our yard that we had not counted on. We have our annual winter visits from a Sharp Shinned Hawk. âSharpiesâ? are Accipiter hawksâ¦that means they eat birds. Weâve had some wild events in our backyard since the hawk has put us on his winter menu. Itâs pretty easy to determine when heâs on the prowl â there are no birds to be seen anywhere in our yard, or worse, we see the pile of feathers he/she leaves behind. Nature is known for her drama. Fortunately, they move on early in the springtime so we can enjoy the nesting season. Our most unique winter sighting was a Red Poll. This is an arctic bird that somehow got off track. It was by pure luck that we identified him correctly, but it was a sure sighting. A âfeatherâ? in our birding cap. 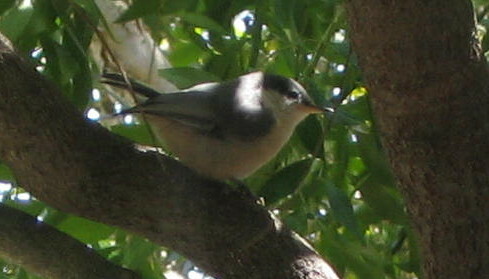 The delicately beautiful Nuthatch rests on a branch in Cherie and Peter’s meditative garden in sunny El Granada. Next PostNext Hollywood’s Version of the Wild West or Authentic Old Half Moon Bay?